Anyone who has problem in using please contact with us first, we will try our best to resolve your problem. This USB 3.0 DVD burner is a perfect companion for computers without internal drive. With this CD / DVD burner, you can watch DVD movies, burn files, movies to a CD / DVD, install software and create backup discs etc. Combined with one USB 3.0 cable, no external power and driver required. Plug and play. 1. Please hook up the device to the direct USB port on your computer. 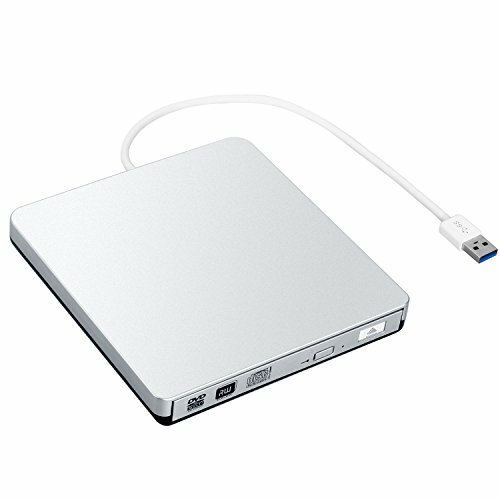 If you connect it to a USB hub or extension cords, it may not recognize the drive or read the CD / DVD, so this drive is Not suitable for The New Macbook Pro. 4.This drive is not fully compatible with computers of windows 10 system due to the compatibility issues between windows 10 itself and the external hardwares. Every ZSMJ Product includes a 45 Day refund, 18-month, worry-free Guarantee! Easy-to-reach support. 【CLASSIC APPEARANCE】 With grinding surface finish, this CD/DVD writer/burner is fashionable. This optical drive features ultra slim, lightweight, compact, portable. 【USB 3.0 INTERFACE】 The DVD-RW drive and the USB cable are combined in one. You won't be annoyed by losing this little cable.